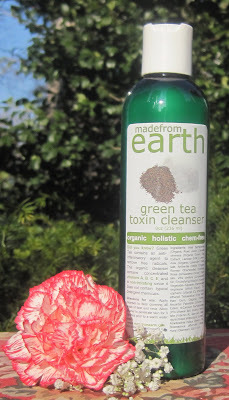 My experience with Made from Earth Green Tea Toxin Cleanser has shown that natural ingredients can provide the same deep cleansing action as chemical surfactants. This product is dual purpose. It can be used as a daily cleanser or left on the skin longer as a pore refining mask. There is an array of skin healing components: aloe, green tea, milk, honey, lavender, and chamomile along with Vitamins A, B, C and E.
Green Tea Toxin Cleanser has a creamy consistency. I find that I only require a small amount to throughly cleanse my dry skin. The flip cap seems to dispense more than I would need. I shake the bottle to move product towards the top of the bottle neck. I dab a little on my finger tips and massage it evenly onto my face and neck. I could see Green Toxin Cleanser benefitting a variety of skin types. Adjusting the amount applied changes the level of cleansing. A medium coating of product left on the skin for a few minutes will act as a deep cleaning facial mask. For dry or combination skin, you can apply the cleanser as a mask to the T-zone area and then dot a smaller amount on the cheeks right before rinsing. I love using this technique in the shower so I can multi-task. This cleanser has a light and fresh scent that makes it pleasant to use. The natural fragrance doesn't linger in any way. While Green Tea Toxin Cleanser is technically unscented, the herbal and floral ingredients offer a gentle perfume. Ingredients: Aloe barbadensis (Organic Aloe) Juice, Camellia sinensis (Organic Green Tea) Extract, Lactose (Milk), Lavendula (Organic Lavender) Distillate, Anthemis nobilis (Organic Roman Chamomile) Distillate, Rosa damascena (Rose) Distillate, Vitus vinifera (Grapeseed) Oil, Emulsifying Wax NF, Kosher Vegetable Glycerin, Hamamelis virginiana (Witch Hazel), Tocopherol (Vitamin E), Phenoxyethanol, Tetrasodium Edta, Xanthan Gum, Organic Honey, Ascorbyl Palmitate (Vitamin C Ester), d-Calcium Pantothenate (Pro-Vitamin B5), Retinol Palmitate (Vitamin A), Mannan, Salix nigra (Black Willowbark) Extract, Azadirachta indica (Neem) Oil, Rosmarinus officinalis (Rosemary) Oleoresin, Citric Acid. As the primary ingredient, aloe is reputed for its skin healing benefits. Aloe has a similar pH balance to human skin, making it useful in healing acne, inflammation and sensitivities. It's vitamin, mineral and nutrient rich composition helps deliver more oxygen to the skin to assist with cell turnover. This action can help skin appear more youthful. Since it contains milk and honey, Green Tea Toxin Cleanser is vegetarian, but not vegan. The idea of milk as a cleansing ingredient makes me think of Cleopatra and her famed milk baths. There is science behind the luxury. The lactic acid in milk is a natural exfoliant, assisting in brightening the complexion. Honey has antimicrobial properties. It is known to help treat acne. As a cleansing agent, it can help remove impurities from the skin while adding softness. If you are looking for a natural product to provide deep cleansing with respect to skin sensitivity and pH balance, Made from Earth Green Tea Toxin cleanser is worth adding to your regimen. I definitely recommend it. Green Tea Toxin Cleanser was sent to me for review. This product can be purchased at madefromearth.com. The retail price is 15.99 for an 8 oz. (36 ml) bottle. Green Tea Toxin Cleanser is currently on special along with many other skin care items throughout the site. Would you like the chance to win a full size bottle of Green Tea Toxin Cleanser along with BB Couture nail polish and a chic wristlet? Stop by the Get Festive Giveaway! before the end of the day January 7th to enter. Oh wow. I might have to try this. my mom uses that cleanser and loves it! I think I may give it a shot now...thank you for the review. L: It's a definitely worth a try! Crystal: This product has so many noteworthy ingredients! Anon: No problem. Your mom is definitely onto a good thing!